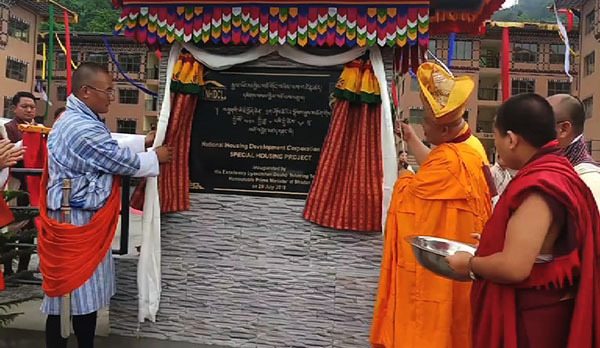 The National Housing Development Corporation Limited (NHDCL) has completed constructing 20 buildings in Phuentshogling. The prime minister inaugurated the buildings on Sunday. The buildings are a part of a housing colony that NHDCL is building to ease housing crunch in the border town upon the command of His Majesty The King. It’s mainly to accommodate Bhutanese living across the border in Jaigoan. Acute housing shortage in the town has compelled hundreds of Bhutanese, mainly those from the low income group, to live in Jaigoan. There are believed to be about 5,000 of them at the moment. Pema Jamtsho lives in area that is popularly known as the Chinese Lane in Jaigoan. “When I return home late from work, some local people threaten us. The power and water supply are also erratic. It would be great to live in Puentshogling,” he said. The 20 buildings inaugurated on Sunday have 160 two-bedroom units. The entire colony, when it completes by the end of this year, will have 506 units altogether. “I think the housing crunch will be eased to a great extent,” Thinley Dorji, the Chief Executive Officer of the NHDCL said. The completed units will be allotted on a lucky dip basis. “We have received 1,200 applicants from people living across the border. An independent committee will do the allotment,” the CEO said. The monthly rent will range from Nu 4,000 to Nu 7,000. The NHDCL has invested Nu 180 M for the construction of the housing colony.